Take an Aboriginal cultural cruise on Sydney Harbour with Tribal Warrior. Tour operators entertain visitors with stories of the Eora, Cadigal, Guringai, Wangal, Gammeraigal and Wallumedegal peoples. Blue Mountains Walkabout is Aboriginal owned and guided, and it follows the Darug songline through the mountains. Visitors learn by following a traditional walkabout song line. A certain level of fitness is required, the full-day adventure includes challenging bushwalks with plenty of time to relax by crystal clear waterfalls and billabongs. Gavala Aboriginal Art Gallery, located at Darling Harbour in inner Sydney Central, is an Aboriginal-owned gallery and shop. Featuring authentic Australian indigenous art by significant indigenous artists, the gallery deals directly with the artists and their communities. Boomalli Gallery delivers a regular exhibition program highlighting urban Aboriginal contemporary arts to regional, national and international audiences. As well as a full exhibition schedule, Boomalli provides a commissioning service and advises artists on such collaborations. Phone: +061 2 9560 2541. Gallery: 55 - 59 Flood Street Leichhardt, Sydney. Umbarra Cultural Centre, 375 km south of Sydney near Bermagui, gives visitors the chance to learn about the Yuin Aboriginal people. The centre runs guided 4WD tours to local sacred sites at Gulaga (Mount Dromedary) and Biamanga (Mumbulla Mountain). A growing number of NSW National Parks and Reserves are being successfully preserved with co-administration from the NSW government and Aboriginal Tribal Councils. There are Discovery Tours available, including the Aboriginal Discovery Program, giving you further chances to learn about Aboriginal Culture and Heritage. Photo on the Top of Page: Guided tour of Aboriginal art with Badger Bates, Mutawintji National Park, Outback NSW. 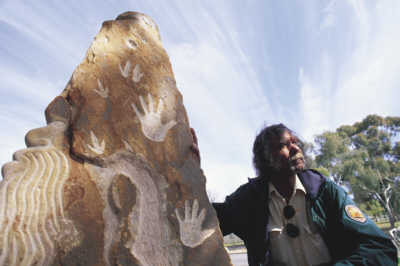 Badger Bates is a noted Broken Hill artist, Aboriginal Elder and Senior Archeological Officer for the NPWS, Broken Hill. 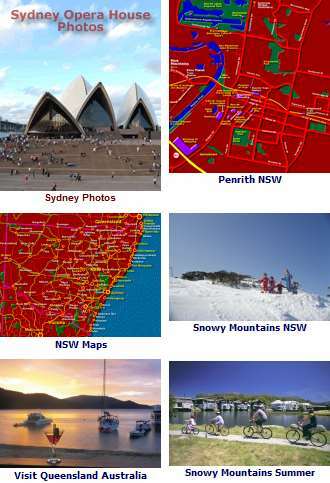 Call the National Parks Centre for more info at 1300 361 967. Please support Australia’s Aboriginal and Torres Strait artists by purchasing only genuine original art, indicated by label.